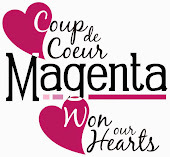 Magenta: LOVE this flower stamp! / J'ADORE cette étampe de fleurs! LOVE this flower stamp! / J'ADORE cette étampe de fleurs! LOVE this flower stamp - will be using it a lot! It's so versatile! And elegant! 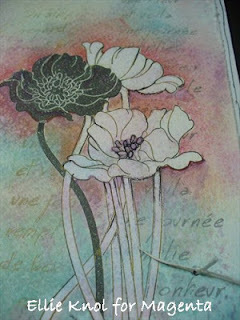 I did the coloring around the flowers after I stamped it. I then masked it, and sponged over it. The background was one of my stash, 'cleaning up' my craftsheet after I've been using some ink for something else. The flowers were not colored, but de-colored with some white acrylic paint, showing a little of the original background's color. J'ADORE cette étampe de fleurs - je l'utiliserai beaucoup! Elle est tellement versatile! Et élégante! J'ai coloré autour de la fleur après l'avoir étampée. Ensuite j'ai utilisé un masque et j'ai épongé par dessus. J'ai utilisé de l'encre pour le fond. Les fleurs n'ont pas été colorée mais bien décolorée avec de la peinture acrylique blanche, à travers laquelle on voir un peu la couleur de fond. Oui elle est vraiment belle cette étampe. Ta carte aussi d'ailleurs. Wow, beautiful stamp. 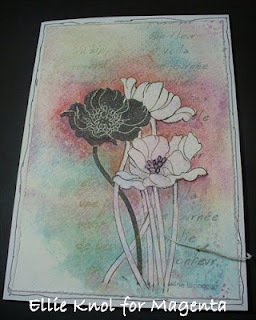 It must be available somewhere in Ontario:-) so hard to find Magenta here... What did you use to color / ink it with? It looks amazing. Hi Beatrice, hope you will read this! I tried to answer this via your blog, but you have no posts on there, and there's no e-mail address either. I've added a description to the post! If you still have questions please post it to my personal blog... but then you have to add a way to contact you somewhere, please..